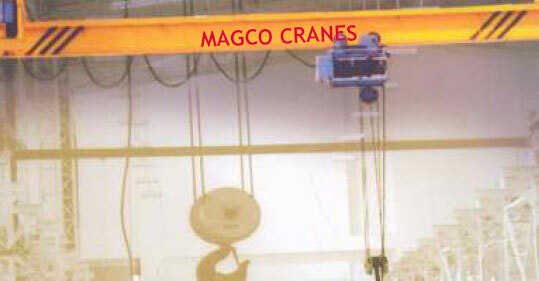 MAGCO CRANES manufactures SINGLE GIRDER BRIDGE CRANES in different configurations. The figure above shows a crane with a box girder and twin drive system. We also manufacture an underslung version as shown in the figure below. Decision regarding the configuration is made depending upon the shed dimensions and lifting requirements of the client. Furthermore, the cranes can be offered either with an Electrically Operated Trolley (EOT) or a Hand Operated Trolley (HOT), again dependent upon the client needs and budget. Class 2, Class 3, Class 4 as per IS 3177 / IS 807. Also available as per FEM, DIN, BS or any other applicable international standards. Twin Drive through unique Conical Rotor type Squirrel Cage Induction Geared Motors with built-in fail safe brakes. Built-in Electro Mechanical Brakes for Hoisting, Cross Travel and Long Travel motions. Optimum design ensuring minimum Dead Weight, Wheel Loads, Head Rooms and Clearances, reducing building costs. Forged runner wheels on Spherical Roller Bearings, resulting in long trouble free service. Hobbed and Run-In Heat Treated Gears machined from High Carbon Steel / Alloy Steels to ensure smooth, silent and durable service. Amply proportioned Main Girder and End Carriages made up of appropriate rolled sections or from rolled sections with cover plates or fully fabricated construction. Well proportioned Dead Axle Type Straight Tread Runner Wheels on Single Girder EOT cranes and Dead Axle Type Taper Tread Runner Wheels on Under-Slung Single Girder EOT cranes. Rope Drum fabricated from IS 2062 plate, fully stress relieved and all the long seams are 100% radiographed. Standardized sub-assemblies used for complete range ensures quick supply of spares in case of emergencies or routine maintenance. All exposed parts primed with Red-Oxide Zinc Chromate Primer and finished with Enamel paint to customers' color scheme.